The county once had over 100 rural schools. Eventually better transportation made school consolidation possible. 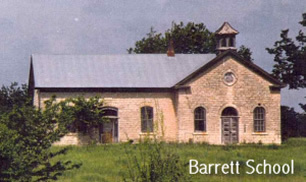 The last rural school closed in 1969. Today only a few schoolhouses are still standing at their original locations. Some schools changed their name over the years. The first school building in Frankfort, used from 1870 until 1880. Moved to the city park in recent years and now houses a small museum. Open on request. Call 785-292-4336. 2nd and Oak Streets, Frankfort. Game Fork. A rural school, closed in 1952 and later moved to Nebraska and Elm streets in the Waterville City Park. Now a designated Scouthouse headquarters. In recent years as part of a spring celebration local schoolchildren have re-created activities of a one-room school here. Bommer. Moved to Marysville from a rural site. When in use it was always painted white. Open all summer. Marysville City Park, S. 10th Street.